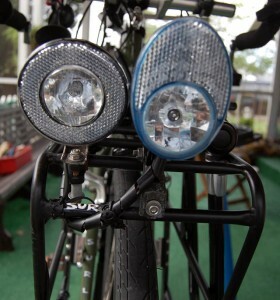 I have “friends” who claim that my Surly Long Haul Trucker is lit up like this 18-wheeler Bro Mark saw in a St. Louis truck stop last year. Half a century ago, when I got my driver’s license, Missouri pushed a safety slogan, “Lights on for safety.” The campaign must have worked, because I run with my car and my bike headlights on. When I first started riding at night, I bought a NiteRider Trail rat for about a hundred bucks. I liked the size, weight, output and the plug-and-forget charger. What I didn’t like was running out of battery power on a long ride. The NiteRider Pro-12E used a bottle-cage battery and had longer run time on low power settings. It powered the brightest taillight I’ve ever used. But, it, too, left me stranded in the dark and having to rely on a backup light on long rides. A ride’s not fun when you see the battery charge indicator dropping and you have a bunch of miles yet to go. I used the SON on my Trek 1220 and then had a wheel built to move it over to the Surly Long Haul Trucker. 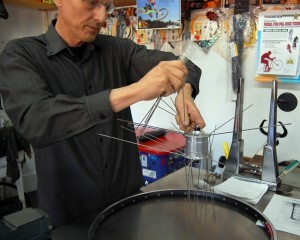 You can see the wheel being built here. I used several different types of lights with the SON. I started out with two halogen bulb lights and found them “OK.” I was happier when I switched the primary light to an LED version, the DLumotec Oval Plus. It came up to full brightness almost immediately. 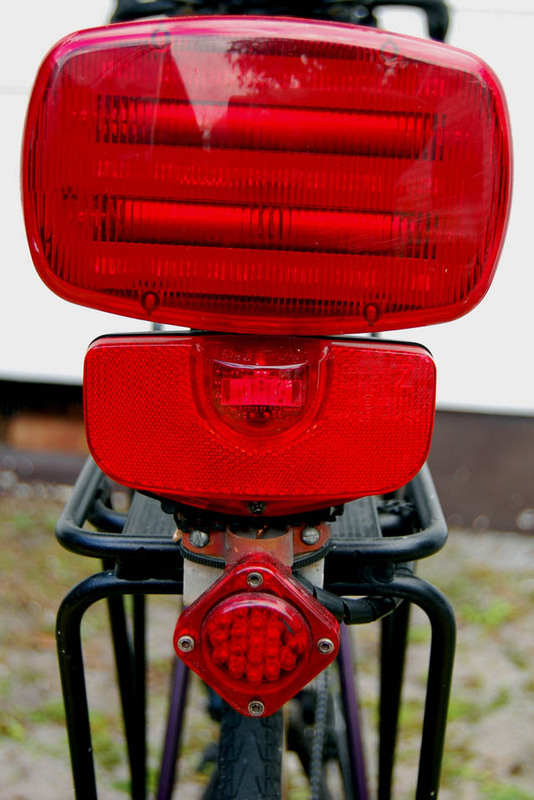 It had a standlight that would glow when you stopped pedaling. Because it was LED instead of halogen bulb, it didn’t darken as it aged and bulb life wasn’t a factor. You could run it all the time. When I read a review of the Cyo IQ on one of my favorite bike blogs, EcoVelo, I just had to try one. It’s the best generator light I’ve owned. I didn’t even consider trying to hook up a secondary light with it. It’s just not needed. Here’s a description of how I installed the light, including a video. I bought a couple cheap Viewpoint Flare 5 LED Headlights from Performance before Kid Matt and I took off for a cross-Florida trip. I figured they’d be good backup lights. We were about 20 miles around and he had about a 1/4-mile lead on me. Just for the heck of it, I put the Flare in strobe mode. He was really impressed with how visible it was. I’ve kept it on the bike as a be-seen ever since. Battery life is excellent. It pops off its mount quickly if you need a flashlight, too. Matt and a lot of other reviewers have had problems with the switch. I wouldn’t count on it for a primary light. Even though statistics show that the odds from being hit from behind are less than most folks would guess, I still like to be highly visible. I use passive relectors and taillights. 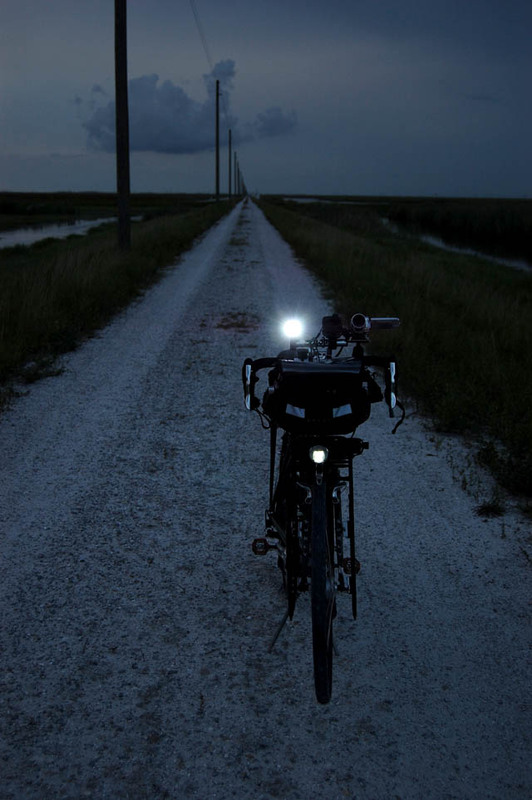 I moved my RealLite, NiteRider taillight and generator-powered B&M 4DToplight Senso Multi from my Trek 1220 to my LHT, even though I quit using my NiteRider when the battery died. One of these days I’ll get around to stripping it off. Here’s how I have them mounted and a full description of each. When I get over the cold that’s laid me low, I’ll be doing a review of the Flashbak Safety Light that the vendor was kind enough to send me. I had hoped to have someone shoot it in action on this week’s Freakbike Militia Ride, but the skies opened up two blocks up the road and I had to cover it with my bike cape. The thing was bright enough that it lit up the whole back of the cape from underneath. I was impressed. UPDATE: Here is the review of the FlashBak. I experimented with a Flash Flag for one ride. The jury’s still out on this. I may fool around with a better way to mount it. 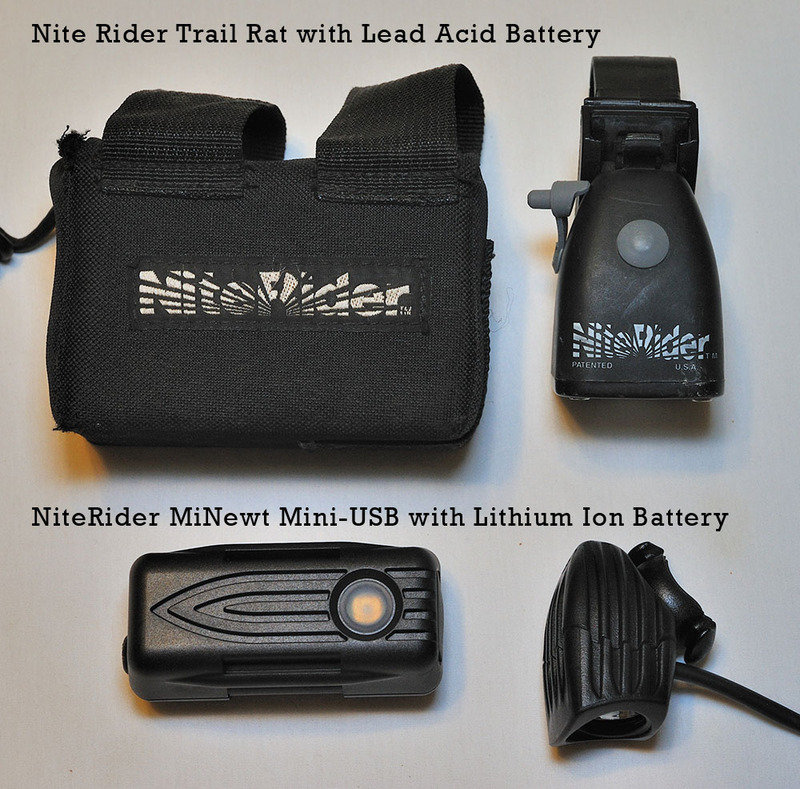 Son Matt, who inherited my original NiteRider Trail Rat has migrated to a NiteRider MiNewt Mini-USB with Li-ion Battery. Glo Gloves help my hand signals stand out. Way back in 2003, I tested the prototype for the current version of the Spor Glo Glove. I liked it well enough to use it when I’m riding at night when conditions are a bit iffy. You can read my full review here, but the thing you may find most interesting is the video of what I look like riding down the road at night. Great advice! Sometimes I want to light my bike up like a Christmas tree, but then it would take so long to remove them all at every stop. No way could I leave them on in Chicago without someone stealing them. How do you like THESE lights? Been looking for great truck lights again this year, but haven’t seen anything like the one I sent you last year. You used to have an aircraft landing light mounted on the front of your car (yes illegal) and as soon as I could own a car I went down to the local airport and went into the parts department and asked for one. “What kind of plane do you want it for?” they asked me. I was not prepared to answer that, fortunately I saw a plane and barked out the kind it was, “Piper Cherokee.” He handed over the light and I found that it fit perfectly in a tractor (John Deere) light housing. Some wire, an inline fuse and a Radio Shack toggle switch and I was in business. Needless to say I went looking for cars that were slow on dimming their lights when approaching. I would flash my regular car bright lights at them and if they didn’t dim their lights, then I would reach under the dash and flip the toggle switch and light up the entire countryside. Yep, you’re right. I had an aircraft landing light rigged for a driving light. I went one step beyond what you did. I installed a heavy-duty relay straight to the battery with the trigger circuit going to the regular high-beam relay. I had a toggle switch like yours so the aircraft light could be turned off completely (for auto inspection, for example); otherwise, it would come on with the high beams. I had a guy follow me with his brights on one night. Nothing I could signal would get him to dim them, so I finally slowed down enough that he had to pass me. As soon as he cleared my bumper, I hit him with enough light to blister his paint. He thought ET was landing behind him. I think the light saved me a couple of times. One night I was running spot news well after midnight when the wide side beam of the light caught something moving down the hill and across the road. I slowed and discovered a couple of mopes were stealing tires from a business near the top of a hill. They’d get them rolling and pick them up on the other side of the road. I had a two-way radio on the rescue squad frequency that was monitored by the Rural Police, so I called it in. Never did hear if they caught them. The other time was coming back from Kentucky Lake. The wide beam caught a deer starting to shuffle across the road. That gave me enough time to slow down and give him a glancing blow instead of wrecking him and me. I haven’t had one since moving it FL. It’s too flat, there’s too much traffic and the roads are to straight to use it much. As a deer widowmaker, I can tell you Florida isn’t too flat or animal-poor to need a bright beam – especially around Lake O where road lighting is by the grace of Ma Nature or not at all. Now THAT is a great bit of decorating! My girlfriend is the kind of woman who buys ‘tasteful’, minimalist lights in cream over Christmas and strings a few up around the house but I’m the type to want to get hundreds up in bright colours. 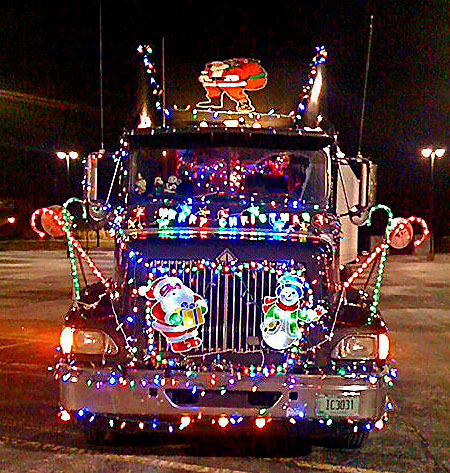 Those truck lights are awesome. Imagine seeing one of those on the road! 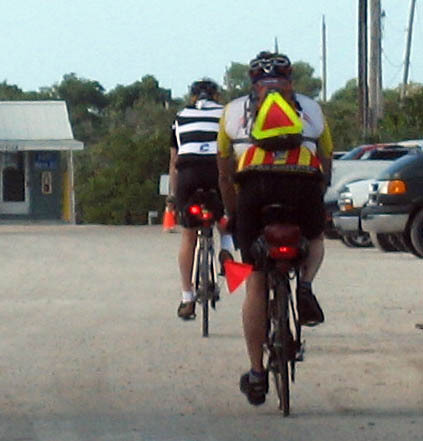 Being on the road as a bicycle rider or a motorcyclist, some of the reflective wear is a great thing to have. Not many people know the feeling of being hit by a car, while you are on a bicycle/motorcycle. Although the gear is not very stylish, I think the Glo Gloves were a pretty cool item, and the triangle patch are a must. Bob Parsons from GoDaddy has been hit several times by cars, and says he would wear head to toe refelctive wear.